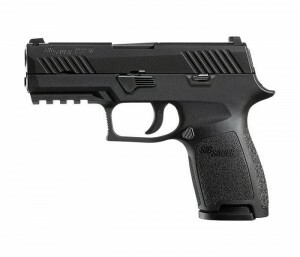 Following what is turning into a flood of internet rumors, memes, videos of the P320 firing when dropped, and a statement last week from Sig Sauer reaffirming the safety of the p320, the company is issuing a “voluntary upgrade” of the pistol that was recently selected for use by the US Army, Air Force, and numerous law enforcement agencies. The P320 meets U.S. standards for safety, including the American National Standards Institute (ANSI) / Sporting Arms Ammunition Manufacturers’ Institute, Inc. (SAAMI), National Institute of Justice (NIJ), as well as rigorous testing protocols for global military and law enforcement agencies. Sig Sauer’s new P320 – which won the XM17 bids for United States Army and Air Force Modular Handgun Systems and has been adopted by a number of relatively high-profile law enforcement outfits – has been facing some online heat as of late. The P320, which beat out offerings from Glock, FN, Beretta, and others, will become the US Military’s new M17 pistol to replace the Beretta M9 and Sig’s old P228 variant, the M11. The XM17 competition results were hotly contested by other manufactures, most notably Glock, who have challenged the results multiple times. The P320 meets and exceeds all U.S. standards for safety, including the American National Standards Institute (ANSI) and Sporting Arms and Ammunition Manufacturers’ Institute, Inc. (SAAMI), as well as rigorous testing protocols for global military and law enforcement agencies. All SIG SAUER pistols incorporate effective mechanical safeties to ensure they only fire when the trigger is pressed. However, like any mechanical device, exposure to acute conditions (e.g. shock, vibration, heavy or repeated drops) may have a negative effect on these safety mechanisms and cause them to not work as designed. This language is common to owner’s manuals of major handgun manufacturers. As a result, individual attempts to perform drop tests outside of professionally controlled environments should not be attempted.